Sharpend Japanese sword made of forged steel by swords-smith called for "Shinken" It is super sharp and dangerous, but beatuiful. Shinken is made of steel "Tamahagane". It is made by "Tatara" . "Tatara" looks like a furnace made by clay. A especially excellent part of "Watetsu" is called "Tamahagane" and this is a main material of a Shinken. 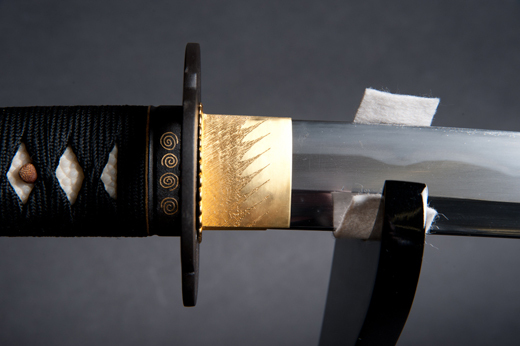 "Tamahagane" is very hard and pure steel, But it is rare steel and expensive. It takes over 8th months to make Shinken It's price is at least 1600,000yen at the curent rate(August 20th 2016) that is roughly16,000 US Dollar. 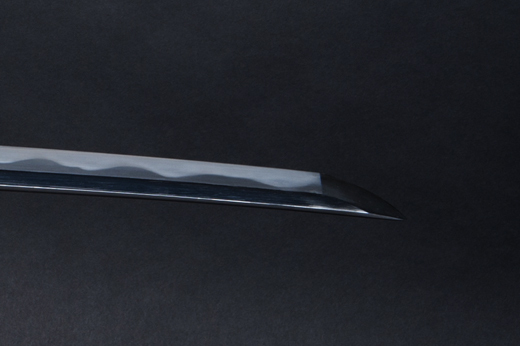 Our iaito Japanese sword blade is not made of any carbon steel. The blade of our swords made of original duralumin (aluminum/Zink alloy).So the blade is not sharp. 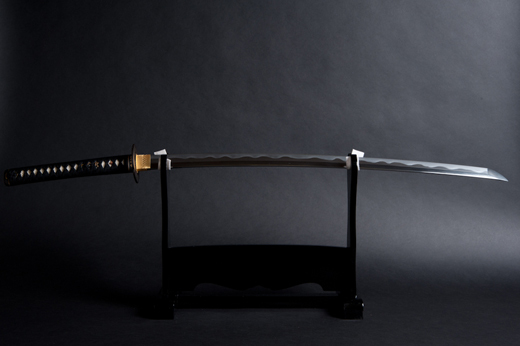 No one can not make iaito sword blade of stainless steel in Japan. It is prohibited by law in Japan. Because when the blade made of every steel including stainless steel that is grinded or sharpened by some method, the blade become sharp. 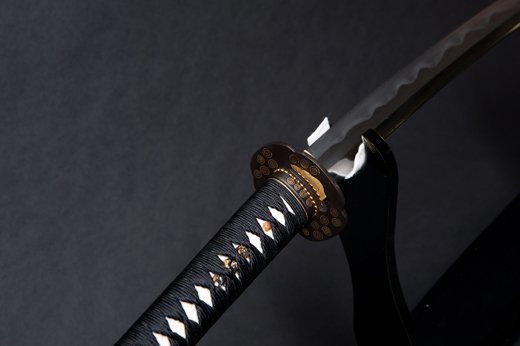 Any sharpened sword except for "Shinken sword"(real Japanese swords) authorized by government are treated as weapon in Japan. 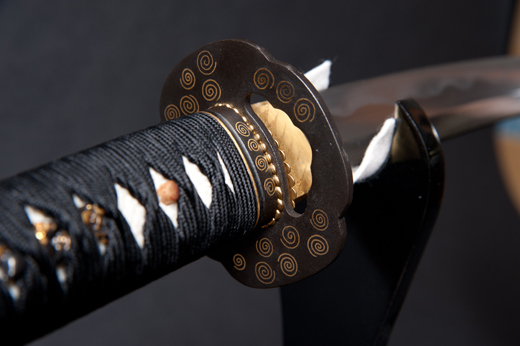 Any sharpened sword except Shinken authorized by government are treated as weapon in Japan. So we can not make and sell it. I think that all "Japanese sword stainless steel blade" are made by factory of China, Taiwan or some country except for Japan. If any one grind or sharpen and polish the duralumin blade of our iaito, it don't became sharp enough to cut anything. But all our iaito are made by swords-smiths of "Shinken sword". They are skillful experts who had been made many Shinken. So althogh it is not sharp and material is not hard like Shinken blade, the balance and weight of the blade is same quality as Shinken blade. The the material and quality of the Koshirae (Saya, Tsuka, Tsuba, Menuki, Fuchi and Kashira) is same as one for Shinken. How to make Shinken (Method of forging blade, sharpening the blade and making beatiful Koshirae) is important traditional skill and culture of Japan. Japanese goverment must keep the skill and the culture forever. So they decided that only Shinken swords made by correct method by skilfull swords-smith are not treated as weapon in Japan. They treat only Shinken as "work of art" in Japan. So Shinken must have requirement as follows, They must be made by experts authorized by government office. They must be authorized by government office too, and need registration card. So it is very expensive, but the blade is super hard and sharp.